Family Ties by Gary Paulsen. A Kevin Spencer Book. Review: Do you like books about family mess-ups, and about teenage situations? Well then Family Ties is a great book for you written by Gary Paulsen. In this book Kevin Spencer a fourteen-year-old boy, is considered a family man. He also has a girlfriend of his own. But when his uncle comes, he now has to plan a wedding for them. But with his own troubles, and activities at school, will he be able to do it? Family is important to Kevin; he's always bringing the family together. One Sunday afternoon while the Spencer family is minding its own business, uncle Will comes. It turns out that uncle Will comes to tell the Spencer's that he has gotten married. Nobody knew about their marriage and they want to see them get married in person, so they decide to make a new wedding. Since everybody is busy, Kevin has to plan it all on his own. Will he be able to do it while having schoolwork and his teenage problems? And will he be able to make it the special wedding he wants it to be? Family Ties is intended to children 10-14 years of age. It has a few words young children might not understand and there are some feelings that older children can relate to better than younger readers. This story is great for young adults (10-14) because it has humor and excitement young adults will love. It is also filled with a range of emotions. Family Ties will catch your attention, and you will not want to put the book down. But if you don't believe me get it for yourself and have a great time reading Family Ties. Review written by Ashley (6th grade student). We would like to thank Random House for providing a copy of Family Ties for this review. 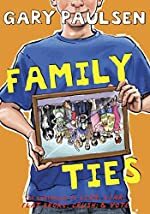 Have you read Family Ties? How would you rate it?